Scalable Display Technologies, world leader in automatic projection tools for simulation, was on display at the Association of the United States Army (AUSA) 2018. Scalable worked closely with partner Q4 Services to deliver a state of the art visual system for Lockheed Martin. 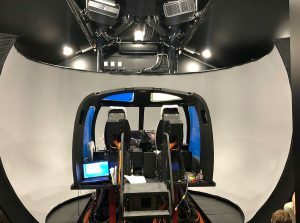 The simulator is also portable, housed in a tractor trailer, so the display can be moved from site to site and setup quickly and accurately using Scalable’s automatic calibration. This system was debuted during AUSA 2018 to great acclaim, demonstrating the capability’s of Sikorsky’s new Future Attack Reconnaissance Aircraft. Defense News captured the simulator and the experience in this video. Scalable Display Technologies is the market leader in automatic, camera-based projection software, specialized in dome projection, curved screens and simulation applications. Q4 Services is a world-class , high-performance supplier of technically innovative and unique visual solutions for simulation, with special focus on collimated displays, Q4 is known for superior customer service and unmatched expertise in the industry.